Since getting my results back I’ve judged/staffed/organized in 11 competitions, and earned 19 points (7 non-judging). That puts me at 23.5 points total when you include the comps I judged, as a Provisional judge, before getting my score back. All this to say, I’ve been quite active in the beer judging community, and have been loving it. Since writing the exam I definitely feel that I have improved in my perceptive accuracy as a judge, some things just take practice! I’m writing this post because I want to pass on some of the things I learned going through the process. I’m not here to claim that everything I say is correct, or that I’m some super judge (I’m not). There are plenty of people out there that could school me on BJCP exam and scoresheet writing (and some may when I post this on the BJCP Facebook Group). Part of the reason I love beer judging is because I learn something new every time I judge. I’m also writing this because a group of friends in Toronto is taking the exam in May and I want them to do as well as possible. Mostly because I want more ranked judges for Brew Slam this fall (:P), but also because I like them! Aside: If you are a beer judge reading this, we’d love to have you come judge our Brew Slam competition Sept 30-Oct 2 in Toronto. For full details of what is involved in the BJCP Tasting Exam, check out the Exam Center on their website for dozens of informative PDFs. Don’t forget to check out the Study Guide. In short, the BJCP Tasting Exam is a 90 minute exam where you fill out scoresheets for 6 beers. You are then evaluated based on these 6 scoresheets and assigned a test score by the graders. While you are writing the exam, there are also two (and sometimes more) proctors (National+ in rank) judging the same beers you are. The graders use these proctor sheets and the sheets from your exam peers to form an impression of the 6 beers and you are graded against that impression. Perceptive Accuracy – Did you describe the same tastes, aromas, etc.. as the proctors and fellow examinees. Descriptive Ability – Did you write your perceptions in a detailed enough way using standard and unambiguous language. Feedback – Did you provide enough constructive suggestions for improvement, and were those suggestions technically correct. Also means saying what you liked and matches style. Completeness – Attention to detail. Did you complete all checkboxes? Did you describe all the applicable components in every section? Did you make efficient use of space? Scoring Accuracy – How close was your assigned score to the score assigned by the proctors and your peers. That scoresheet guide should be considered mandatory reading for anyone taking the tasting exam. Read it once when you start studying, read it again after a few months, read it again several times over the few weeks leading up to your exam. 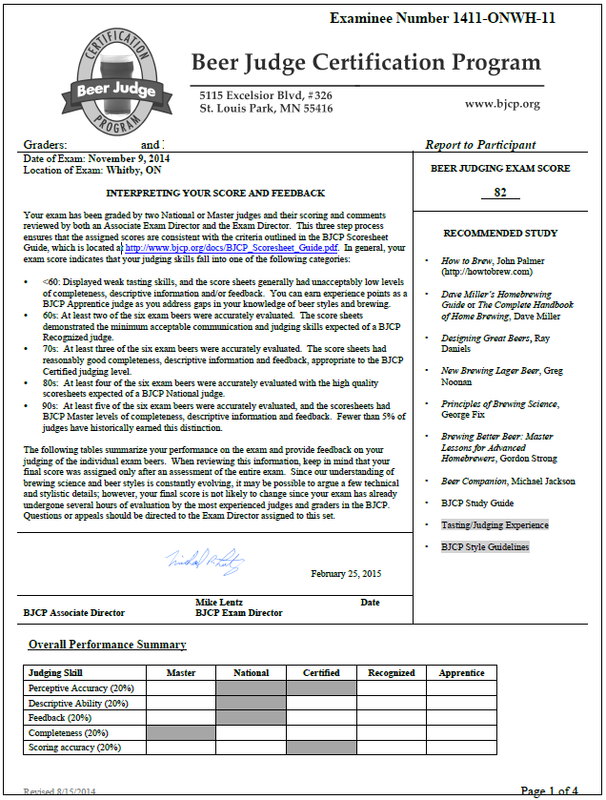 This document describes how to fill out a scoresheet in the way expected by the graders. It’s also worth mentioning that the exam focuses on classic styles. I don’t believe it covers specialty beers at all, and usually not sour/wild beers. I could be wrong about the last part but I don’t think I’ve heard of an exam with sour/wild beer, even the classic styles like Berliner/Gueuze. I hope I didn’t just jinx it for someone writing their exam. I am going to share my Exam Scoresheets and Report to Participant (RTP) so that people can see an example. I achieved a score of 82 on the exam, which is a pretty good score so I think there is some value in reviewing this. When reading through the documents please keep in mind that I did my best, none of my sheets were perfect, and some of my assigned scores certainly weren’t perfect. I’m also putting myself out there by sharing something personal like this so please be gentle. Here’s a brief overview on what I could have done better on each of my sheets, and where I lost marks. I remember this being a fairly good beer and the score of 38 I gave it reflects that. Overall this was a somewhat strong beer for me. A few oversights brought down my scores though. I noted apple esters but didn’t check the box. There must have been a bit of variance in my perceptive accuracy since I dipped into Certified on that. I wasn’t as absolute in my descriptive ability as I could have been when I said “corn-like”. The real weak point here was the Feedback. I liked the beer so much that I didn’t really give much in terms of suggestions for improvement. Eliminating the DMS that I perceived was noted as a potential source of improvement. One thing I’ve learned in my first year of judging is that balance is a very important part of beer. There are lots of things that can affect it that I could have commented on here (water, attenuation, bitterness, etc..). This was definitely my strongest beer in the exam, scoring National or above for 3/5 sections. My descriptive ability could have been improved here. I used the terms “banana type” and “clove type” which aren’t very absolute. You need show confidence in your perceptions during the judging exam by using absolute descriptions, even if your perceptions vary from your peers/proctors. This was another somewhat strong beer for me. My perceptive accuracy was the weakest part of this beer which means that I described different flavours/aromas than my peers/proctors. Not much can be done to help this other than judging experience and learning how to calibrate myself with other judges. I didn’t tick any descriptor boxes here even though I mentioned apple esters at very low level, that probably lost me some completeness marks. I used “some” to append caramel and toffee to the biscuit malt aroma, which isn’t an absolute term. That probably lost me some descriptive ability marks. I scored this beer in the 20’s but only picked out one flaw, which probably lost me some feedback marks. Two or three areas of improvement should probably have been given for this beer. I went into the exam thinking that descriptor boxes only needed to be ticked when the level is low or above. After discussing my exam with other judges I’ve come to agree that it’s better to just tick the box if you mention esters at any level other than none, even “very low” levels. This beer went fairly well, but again I suffered on my feedback marks. This was obviously not a great beer, having scored it a 17. The intense acidity was hard to get past and pick out other flaws. I’m not sure what else I could have picked out, but there is definitely room for improvement on feedback for this beer. This beer didn’t go super well, since I scored it a 28 and the proctors scored it in the 40’s. Still got Master level completeness though! I remember thinking that the beer was way too sweet and dark to be a great Golden Strong, and fit the bill for Tripel more. I still maintain that the beer was a better Tripel than Golden Strong. I was probably being too nitpicky since the difference between golden strong and tripel is pretty blurry and a slightly off flavour balance shouldn’t be enough to knock a beer into the 20’s. I had made a specific point to review style comparisons the evening before so I may have gotten a little overzealous. Obviously my peers/proctors didn’t feel the same way, which is why I got apprentice level scoring accuracy. There were also some small things I could done better in perception/description. The last sentence of my aroma section was fairly vague and could have been phrased better since I was just trying to say the aroma hit the mark for style and “Belgian Ale” isn’t very specific, “Belgian Golden Strong” is more specific. Feedback could have been more specific and plentiful, especially since I scored it in the 20’s. Definitely my worst performance on the exam, again I was majorly off on scoring. There was something about the balance of this beer that spoke to me so I wanted to score it high due to good drinkability. The baltic porter was fairly roasty in malt quality and too intense in quantity to be a world class example. I believe the proctors scored this one in the mid-lower 30’s so I was way too high in score. Reading my perceptions now, I should have scored it in the mid-high 30’s. I definitely could have done better in descriptive ability and not said “lager-like ester aroma”. Well made lagers don’t have distinctive esters so this made no sense. Also I forgot the check the ester box after mentioning esters. Overall I was really happy with how my tasting exam went, scoring an 82 on my first write was an honour. I hope this break down on my exam will help others as they prepare to write their own exam. The exam is mostly about how well you can fill out a scoresheet. Learning how to fill it out correctly is the best thing you can do to prepare for the exam. My secret weapon for this exam was completeness, as you can tell by the Master level overall score. These are the easiest marks to get, you just need to focus on being detail oriented and not miss anything. Make sure to fill everything in on the sheet (including any appropriate checkboxes and lines). Also make sure to cover everything hinted in small print in each section. Completeness is also graded on use of white space, make sure you fill in all the lines! The image below shows all the check boxes that need to be completed, don’t forget to check the boxes in the Stylistic Accuracy section! Fake it ’till you make it. If you know the guidelines well enough, you should have a decent idea what to expect in each style of beer. If no words comes to mind as you perceive the beer, use your knowledge of the style to fill in the gaps. As you gain experience it will become easier to put words to your perceptions. However, make sure that you aren’t making assumptions about the beer as a whole based on style, this can get you into trouble. This trick is only works to help fill in qualitative descriptors when nothing comes to mind. Learn the vocabulary and use it. The style guidelines use a certain set of qualitative descriptive words for each beer component. Learn what these are and use them. If you use strange and non-standard language during the exam you will probably lose marks. The BJCP also links to several flavour wheels from their page, and the Glossary section of the BJCP guidelines lists several of these words as well. Come up with a formula for descriptive ability. If you read through my scoresheets you may see some patterns in terms descriptive structure. Everyone has a different process, but you need to keep in mind that every applicable component needs to have both quality and quantity qualifiers added to both to the primary and secondary characteristics. You need to do this for each of the applicable components listed in small print beneath the section headings (pictured below). Eg. “Moderate citrusy American hop aroma, with notes of tangerine and pine needles” instead of just “hoppy aroma” or “medium hoppy aroma”. Be absolute. Don’t give ranges in your quantitative descriptors. “Medium-low” is okay but “Medium to low” isn’t absolute. Avoid vague quantitative words like “a little” or “some”. Either write the same sentence without that word, or give an actual quantitative descriptor like low. Don’t say that there “may” be something present, either it is or it isn’t present. Don’t append your qualitative words with “-like”, just be absolute and call it what it is. Scoring accuracy is somewhat unpredictable and one of the biggest variables in judging, unfortunately the total score is also the first detail someone looks at when reading a completed scoresheet. The scoring guide is very helpful since it helps guide you to the correct scoring range based on your perceptions of the beer. I find that most commercial beers fall within 30-37 when they have no major technical faults, are generally within style, but just don’t hit the balance of flavours right to really nail it. Beers that have easily noticeable flaws or don’t hit within the style range generally fall into the 20’s. Beers that really hit the style with no noticeable faults can go above 37, though usually even world class examples score under 45 when served blind. This comes with time as you judge more competitions in different areas. Target at least one feedback item per scoring guide range they need to pass through to hit 50 pts. Target a minimum of two feedback items overall, even for Excellent beers. Make sure your feedback is technically correct, otherwise you will lose major marks. Don’t make assumptions about recipe or process when giving feedback. If you are writing improvement suggestions for all grain brewers, give an alternative for extract brewers. Also get used to writing “if you did A”, instead of assuming that they “did A”. Participate in an off-flavour session. Each exam admin is allowed to order one subsidized off-flavour kit for the examinees, coordinate with your peers to make this happen. Make the time to participate in this exercise, it is invaluable. I would recommend doing it at least several months before the exam you can have some time afterwards to reinforce the knowledge in your group study sessions. As a beginner judge sometimes you learn to associate the wrong flavours with these off-flavour words, off-flavours sessions can help with that. It’s also a good idea to periodically re-do this even after you have passed the tasting exam. Don’t hunt for faults. A good judge describes the beer in front of them. Just because a flaw is common in a style of beer doesn’t mean that it’s always there in every beer. Make sure you actually detect an off-flavour before checking that box. I’ve seen new judges go on off-flavour hunts and insist that every beer they taste has a several flaws, don’t be that judge. Practice writing complete scoresheets! This is a timed exam and you only have 15 minutes per beer to write the best scoresheets of your life. You need to practice writing scoresheets as much as possible so that you can learn how to do it well, and within the time limit. Asking some senior judges to review your practice scoresheets for descriptive ability and completeness is a good idea. Judge in real competitions. Most competitions allow provisional judges to judge. This is also great scoresheet writing practice. Be aware that most judges don’t write exam quality scoresheets in every competition, so if you are doing that you will be slower than the other judges at your table. These competitions are a great place to compare your perceptions and scoring accuracy to more seasoned judges. Also, you should become Provisional (pass the online exam) as soon as you pass the 1 year mark until your tasting exam. I hope these tips help, let me know what you think of them! I’m going to close out this super long blog post with a quick list of resources that you can refer to during your studying. I hope this (way too long) blog post has been helpful! There are several other PDFs posted on the Exam Center, that are worth reviewing. – Note: The name of this post is inspired a by the name of his podcast 🙂 Cheers Aaron! Great writeup Eric! I can also recommend checking out the BJCP Classic Example Scoresheets as an excellent resource for 1) how the classic examples are scored 2) by a grand master level judge (Gordon Strong, I think). I think you can use those scoresheets as a model for how to fill out a sheet. Congrats on the certification! Also, great write up on the BJCP tasting exam scoring process; it can be a bit intimidating for new test takers. Have you taken the written exam? You’re pretty close to a National standing; cheers! It’s in progress. I was originally planning on taking it before they switched away from 2008 guidelines but they cancelled the test. Now I need to learn 2015 guidelines better. Planning to take the written in the fall. Nice! I have both the 2008 and 2015 BJCP guidelines on my phone and read them while I’m bored. There are few differences but it isn’t dramatic as some brewers make them seem. I think the biggest difference is the host of new styles; however, word on the street is that the tasting/written exams going forward will stick pretty close to the 2008 guidelines. Just my two cents. Congrats again; cheers! Excellent Blog…I enjoyed it while reading. It makes me aware for guidelines using while making wine. Please keep sharing.